Atari Age member Alp is currently working on a new homebrew title for the Atari 2600 that truly looks amazing. 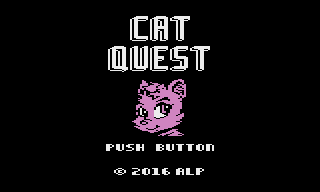 The game is called Cat Quest. The game is, essentially, a port of this very game Alp had been working on for the NES. Alp is using the "venetian blinds" interlacing technique to potentially minimize sprite flickering. This is still in early development so be sure to check the thread (link below) to follow its progress. Here are some images of the game. Using the Venetian Blinds technique. Some folks are asking him to make this on the 7800.